A second wine that has improved dramatically is the Alter Ego de Palmer. The 2009, a blend of equal parts Cabernet Sauvignon and Merlot, exhibits aromas of blackberries, cassis, chocolate, roasted espresso and a smoky/foresty note. 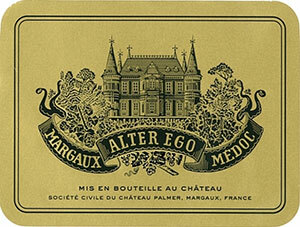 This hedonistic, juicy, succulent Margaux is meant to be consumed in its first 10-15 years of life. Drink 2012-2017. The delicious 2009 Alter Ego de Palmer (an equal part blend of Merlot and Cabernet Sauvignon) could have been drunk when I tasted it. A dense ruby/purple color is accompanied by smoky blackberry and black currant fruit notes, and a silky smooth, expansive, hedonistic, pleasure-filled wine that should drink well for a decade. Drink 2010-2020. Tasted at the chateau. A lucid purple colour. A blend of 48% Cabernet Sauvignon and 51% Merlot, I do not even need to approach the glass to nose this wine. Just under 13.7% alcohol. A sense of controlled opulence here, black plum, a touch of cassis and bilberry, the oak just a little dominant at the moment but that will subsume itself into the wine with time. The palate is full-bodied with seamless tannins, a typically plush, approachable Alter Ego with black cherry, a hint of thyme and white fennel, gentle but insistent grip towards the finish. What a second wine. This is so delicious with a dense palate and beautiful yet friendly structure. Velvety tannins coat your mouth but it is the savory fruit that brings you back for more. Love the chocolate and coffee undertones. Better in 2016 but beautiful now. Ruby-red. Precise aromas of red cherry, blackcurrant, cocoa and minerals. Bright and fresh in the mouth, with luscious flavors of red and black berries. Finishes clean and long, with an obviously inky/flinty note and mounting tannins that will need some time to resolve fully. A very successful Alter Ego.